The state of reverie, or hypnogogic reverie, has been researched through the 1970’s, as a natural altered state of consciousness, linked to meditational trance and hypnotic drug use. 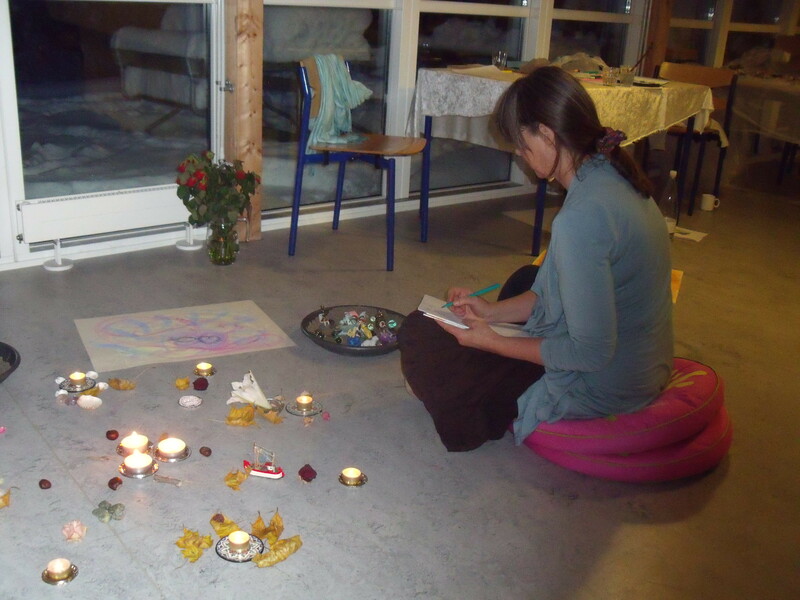 Creative/expressive arts are known to produce this change of consciousness, as well as healing and therapeutic work. CLIA is committed to raising awareness of this natural ability we all have of feeling ‘lost in time’, creatively absorbed or just blissful, and the understanding that through this our emotional experiences are re-integrated and ‘settled’. The events involving Expressive/Integrative Arts and Visioning(R) that we plan aim to support our efforts in feeling re-connected with an often confusing and stressful world, through a relaxed, peaceful state. Creative Journal is like a meditation, an extended daydream and a sort of self counselling experience of playful reflection. This is often experienced when out in natural landscapes or being fully absorbed in what we are doing. 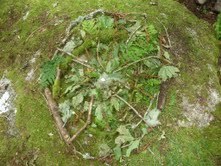 A mandala of sticks, moss and leaves. 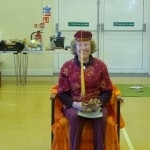 It is only now that the work of the Play Team Association has developed training Non Directive Play and run events in Expressive Arts for Families that the process has begun describing the creative and healing effects of our natural ability for empathic listening and formless reverie in during play. Written by the founder and Creative Director of Play Team, for the Play Therapy UK Congress of 2010, held in Morrocco, the following article introduces the healing effects of ‘formless’ (or creative/healing) reverie as it is experienced in non directive play with children. 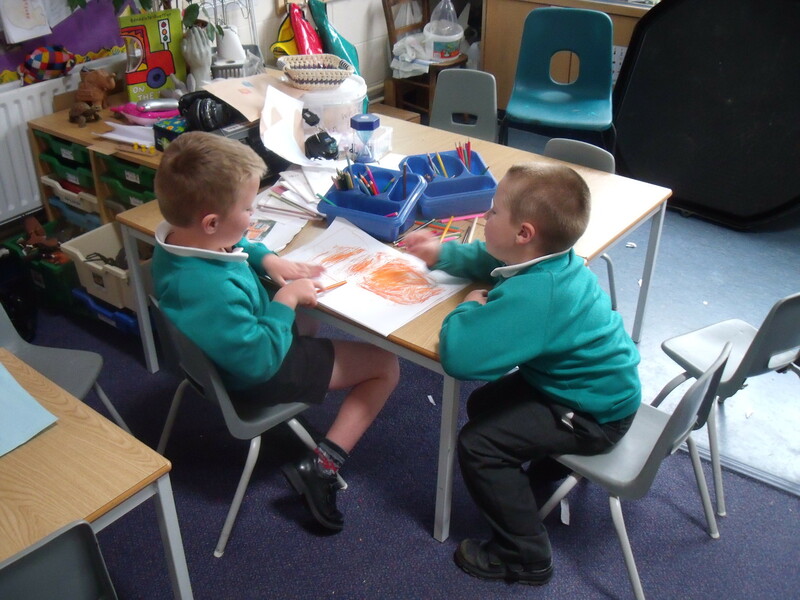 Learning Support in school with Creative Journal. Abstract for PTUK Congress 2010. Since I trained with Rachel Pinney work under her supervision thirteen years ago I have been interested in the part reverie plays when it occurs in a session with a child. This meditational state can be mutually entered into by both child and practitioner and appears to have a profoundly healing effect. It is spontaneous and cannot be contrived but when it happens creativity appears to blossom. The child sometimes hums quietly and the concentration is deeply held. I am working with a child at the moment and have been for nearly two years, so have been in a position to observe this process and become aware of its value. Winnicott describes the early infant mother relationship where the infant is an extension of the mother’s breast. There is a mutual synchronicity. Attachment theory shows the importance of this early relationship with a good enough mother. 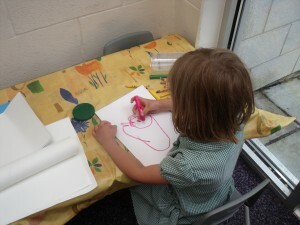 During a “Special Play Time” I provide a selection of art materials. Some children prefer toys and cars, dolls etc. 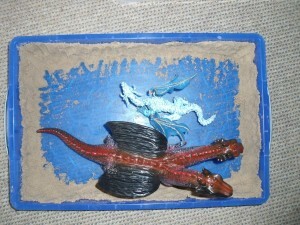 but many of them gravitate towards the paint or the clay or the sticking. 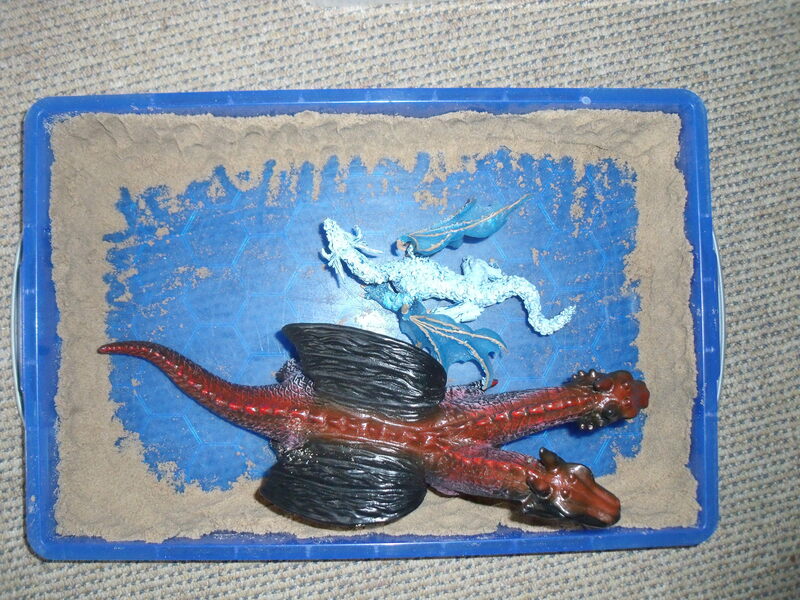 Sandplay is very popular and can be an ideal vehicle for the process of reverie. As Marion Milner writes the reverie “leads to that very otherness from oneself which makes any subsequent sadness at loss possible” It is this “sadness at loss” which can be accessed by the child and a process of healing can take place whilst using the art materials or the sand. This state is reminiscent of the forementioned mutuality between the mother and baby, the non verbal communication where the mother reflects back to the child through the “mutual gaze” during feeding at the breast. From this proceeds the development of the early awareness of “me and not me” The child can then be secure enough for a short time to flounder and still trust. Winnicott allowed adults to experience this formless reverie from which a new sense of integration can emerge. The reverie allows the client to be in touch with this safe maternal experience in a secure environment where “rudimentary play” can take place. In this neutral zone it is safe to go into the unintegrated state of the personality where healing can take place through creativity, as long as there is a process of reflecting back. This seems to be the key to the work we do with children who may not have had the experience of the mutual gaze. When we reflect back what they are doing we are giving them a healing opportunity. I would like to explore this in my talk, mentioning Winnicott, Bion and Maslow’s thinking on the subject and also the work of Marion Milner. If children can receive this reflection at an early age, even if they have not been lucky enough to experience Winnicott’s “dance of intimacy” there is hope that a remedy can be found. Milner, M (1950) ‘On Not Being Able to Paint’ International Universities Press, Inc. Madison, Conn.
Rogers, C (1961). ‘ On becoming a person: A therapist’s view of psychotherapy’. London: Constable. NY. At school, two boys 5-6 yrs share their journal pictures. READ MORE about healing/creative reverie Magnetising your Vision, Science of Sound and Natural Spirituality.